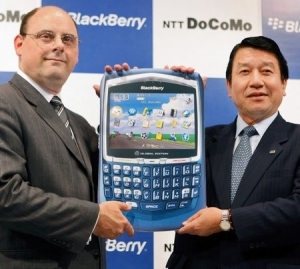 BlackBerry to launch on Japan's NTT DocoMo | BlackBerry Blast! NTT DocoMo announced today it will launch the BlackBerry Internet Service for direct connection to the Internet without the need for a dedicated server on August 1. Responding to requests from individuals and small to midsize businesses, NTT DocoMo will make the service available. Interestingly, it woorks on the BlackBerry 8707h smartphone. Isn't Japan usually ahead of everyone else when it comes to gadgets? The BlackBerry 8707h will be sold through the company's web site, Corporate Business Division and DocoMo Shops' corporate business sections on August 1. The BlackBerry Internet Service will cost 3,045 yen ($30) per month.